Ever wonder how your airspeed indicator works? The answer lies in a basic system called the pitot-static system, which measures ram air pressure and compares it to static pressure to indicate the aircraft's speed through the air. And that's not all it tells you. This same static air system gives us our altitude and tells us how fast we're climbing or descending in feet per minute. The pitot-static system supplies power to three basic aircraft instruments: The airspeed indicator, altimeter, and vertical speed indicator. Pitot Tube and Line: The pitot tube is an L-shaped device located on the exterior of the aircraft that is used to measure airspeed. It has a small opening in the front of the tube where ram air pressure (dynamic pressure) enters the tube and a drain hole on the back of the tube. Some types or pitot tubes have an electronic heating element inside of the tube that prevents ice from blocking the air inlet or drain hole. Static Port(s) and Lines: The static port is a small air inlet, usually located on the side of the aircraft, flush against the fuselage. The static port measures static (non-moving) air pressure, which is also known as ambient pressure or barometric pressure. Some aircraft have more than one static port, and some aircraft have an alternate static port in case one or more of the ports becomes blocked. Instruments: The pitot-static system involves three instruments: The airspeed indicator, altimeter, and vertical speed indicator. Static lines connect to all three instruments and ram air pressure from the pitot tube connects to only the airspeed indicator. Alternate Static Port (if installed): A lever in the cockpit of some aircraft operates an alternate static port if the main static port experiences a blockage. Using the alternate static system can cause slightly inaccurate readings on the instruments since the pressure in the cabin can is usually higher than the main static ports measure at altitude. The pitot-static system works by measuring and comparing static pressures and in the case of the airspeed indicator, both static and dynamic pressure. Airspeed: The airspeed indicator is a sealed case with an aneroid diaphragm inside of it. The case surrounding the diaphragm is made up of static pressure, and the diaphragm is supplied with both static and dynamic pressure to it. When airspeed increases, the dynamic pressure inside of the diaphragm increases as well, causing the diaphragm to expand. Through mechanical linkage and gears, the airspeed is depicted by a needle pointer on the face of the instrument. Altimeter: The altimeter acts as a barometer and is also supplied with static pressure from the static ports. Inside the sealed instrument case is a stack of sealed aneroid diaphragms, also known as wafers. These wafers are sealed with an internal pressure calibrated to 29.92" Hg, or standard atmospheric pressure. They expand and contract as the pressure rises and falls in the surrounding instrument case. A Kollsman window inside of the cockpit allows the pilot to calibrate the instrument to the local altimeter setting to account for non-standard atmospheric pressure. VSI: The vertical speed indicator has a thin sealed diaphragm connected to the static port. The surrounding instrument case is also sealed and supplied static air pressure with a metered leak at the back of the case. This metered leak measures pressure change more gradually, which means that if the airplane continues to climb, the pressure will never quite catch up to each other, allowing for rate information to be measured on the instrument face. Once the aircraft levels off, the pressures from both the metered leak and the static pressure from inside the diaphragm equalize, and the VSI dial returns to zero to show level flight. The most common problem with the pitot-static system is a blockage of the pitot tube or the static ports, or both. If the pitot tube becomes blocked, and its drain hole remains clear, the airspeed will read zero. If the pitot tube and its drain hole are blocked, the airspeed indicator will act like an altimeter, reading higher airspeeds with an increase in altitude. This situation can be dangerous if not recognized immediately. If the static port(s) become blocked and the pitot tube remains operable, the airspeed indicator will barely work and indications will be inaccurate. 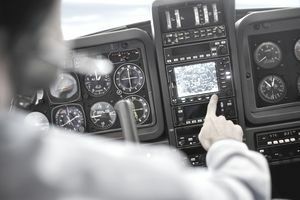 The altimeter will freeze in a place where the blockage occurred and the VSI will indicate zero. Another problem with the pitot-static system includes metal fatigue, which can deteriorate the elasticity of the diaphragms. Additionally, turbulence or abrupt maneuvers can cause erroneous static pressure measurements. Departure Procedures: How Do Pilots Navigate Out of Busy Airports? What is an LPV Approach? Heavy Aircraft vs Large Aircraft: What's the Difference? Aircraft Rental: Is Hobbs Time or Tach Time Better?